legacycentral bbs • View topic - half a million miles. 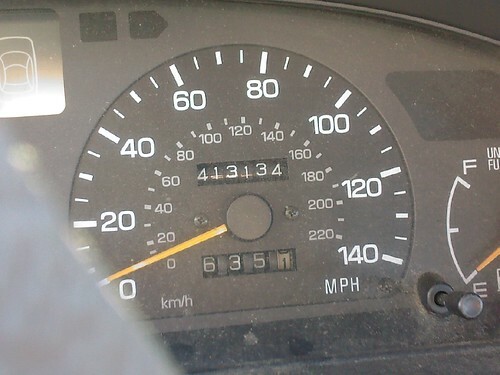 Post subject: half a million miles. Post subject: Re: half a million miles. If mine makes it that far I'll take pictures. I thought I was doing good @ 350K. Guess I've got some driving to do. I'm thinking of just taking pictures of all the odometers when i go now, just to keep a record, and then posting them in this thread. This past week a 466k miles 94 GT wagon was on Craigs, and it still looked new inside. it sold for 900 before i could go look at it. 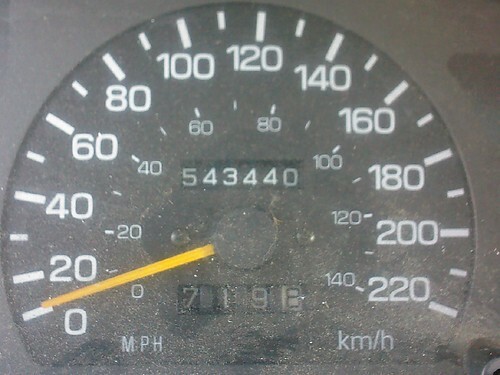 Should definatly start posting pictures of high mileage ones we find. Good idea. I would have wanted to buy that 94 for $900 just to have it lol! Thought about snagging the cluster to swap into my car but that would feel undeserved. Disappointed, I was at pick and pull today and the best i could find was 260k. But there were some disturbingly low ones. 71k and 56k, kinda made me want to cry. so i looked at the pics better, only 46,600 miles. and i bought it for 800. Haven't been over there in a couple weeks, but I might be going soon. I'll keep an eye out just like I always do. and now my old wagon is dead. Ouch! How did you even find your old wagon?